Ascending Butterfly: Make it Earth Week - Check out the Earth Day and Family Friendly title @Disneynature 'Wings of Life' on Video! Make it Earth Week - Check out the Earth Day and Family Friendly title @Disneynature 'Wings of Life' on Video! Whether you spend Earth Day outdoors or indoors, if you are looking for a fun way to engage the entire family, I would recommend Disneynature's Wings Of Life available now on Blu-ray Combo Pack and HD Digital. "Life Depends on the Little Things We Take For Granted." The theme unfolds in a series of stunning displays of Nature at it's absolute finest while exploring the intersection of animal and plant worlds and how they are all inter-dependent on one another. Disneynature is the same studio behind the popular titles "Earth", "Oceans", "African Cats" and "Chimpanzee". The latest release, "Wings of Life" is narrated by Meryl Streep, and her narration has an incredibly soothing quality to it that makes the narration from one scene to the other feel effortless and easy. It is an intimate look into the world of butterflies, hummingbirds, bees, bats and flowers, a third of the world's food supply depends on these amazing creatures. Creatures that are increasingly threatened. There are so many ways to help enhance the movie and activities you can do with your child to help integrate what they see and learn in the movie and help to bring the message home! Teach Your Children to Plant and Care for us. Plant Us In a Window Box! Go Local, Support Your Organic Farmers and Beekeepers! Join a Neighborhood Cooperative Garden! Plant us alongside roadways. The land there is open to everyone! Wouldn't you rather see flowers than trash along the roadways? Plant us in a backyard or a rooftop Garden! Bring Back the Monarchs, Plant Milkweed! 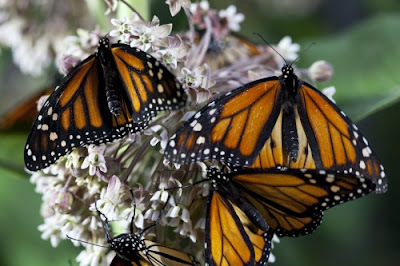 Seeing the Monarch Butterflies in the trees and watching them fly off is one of the most visually impactful moments in the movie, it looks at first as if the butterflies are just leaves that begin to change color for Fall, but the butterflies are actually so plenty in number that they can literally bend the tree! Watching the Caterpillar change into a Butterfly is another one of my favorite scenes in this movie, it's captured in such amazing detail, and is one of the most amazing transformations in nature! Even those pesky picnic pests, Bees, have an important role in Nature as they are the pollinators that keep the flowers blooming by helping them to achieve what they cannot do on their own. The movie ends with a song that says "Where there is life there is love and hidden beauty"
The cinematography is breath-taking, and this family friendly movie has a lesson in it for all ages, this has to be the perfect way to bring a bit of Earth Day home! Ƹ̵̡Ӝ̵̨̄Ʒ - For more beautiful Nature Photos, Follow Disneynature on Pinterest too! Ƹ̵̡Ӝ̵̨̄Ʒ - And you can catch all things Disney Trailers on YouTube too! What 'Green' Thing Did You Do For Earth Day? FTC Disclosure: Disneynature provided Ascending Butterfly with a DVD for editorial consideration, all opinions are 100% my own. This is a beautifully make dvd,shows how connected we all are in this world!